Welcome to Taylor Towers. A premier senior citizen subsidized housing complex located in Westland, Michigan. Taylor Towers is located behind Westland’s City Hall and within walking distance to William Faust Public Library, Shopping, Banking, Grocery, Restaurants, Parks, and many other Retail Outlets. 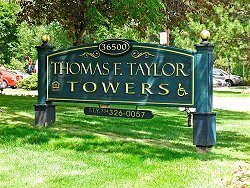 Taylor Towers is your answer to retirement living.